Seven other Boo shawls/items of the knitters choice. All shawls must be full size shawls, not child size or doll size, and they should be as in the pattern (i.e. no turning shawls/scarves into tutus etc). Everything must be started on or after 1st January 2017 (UK time should you want to cast on on the dot) and finished and blocked and photographed by midnight 31st December 2017, again UK time). 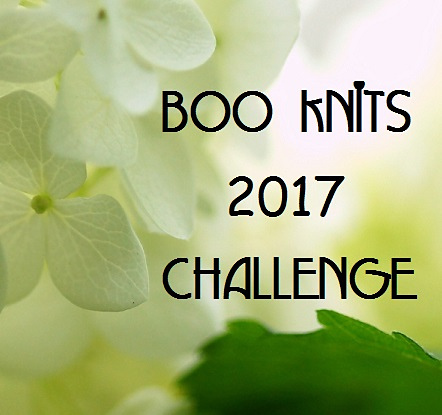 Spot prizes will be drawn during the first week of January 2018 and all knitters will be notified in the 2017 Boo Challenge thread. The above placeholder can be used for projects yet to be started but it would be lovely if you can put your finished shawl as your front photograph as soon as your glamour shots are taken. There will be at least two new MKALs in 2017 as well as new patterns for both the Boos for Beginners and Into the Night Collections so you don’t need to fill everything in right away just remember your post number and come back to update as and when. The thread will be locked at midnight UK time on 31st December 2017 so don’t leave anything to the last minute. Of course, don’t think you have to stop at ten shawls! There will be a prize for the knitter who completes the most Boos in the year but you must post them all in this thread carrying on from Seven to … the world is your oyster! Shawls knit in the monthly KALs will be eligible to be included in this challenge and though Moderators and Test Knitters can join in the fun they won’t be eligible for prizes. There is a Submission Thread to keep track of your projects and there is also a CHAT THREAD where you can plan, chat and show off your yarns/beads etc until your heart is content! Moonflower is the first pattern of the Into the Night Collection. The collection is great value for money compared with buying the individual patterns, there will be six patterns with at least one pattern that is totally exclusive to the collection. Moonflower is designed to be knit in a laceweight yarn, this pretty little shawl is lace from the very beginning. There are only a few beads in the main body that hover below the bottom of each flower. The centre stitch of the shawl is the point of symmetry with each side being a mirror image of the other until the border is reached and the beading and lace intensify for the beaded grand finale that is the border. If you are using a skein with less than 750m/100g I would suggest having two skeins to be on the safe side as yardage requirements are very close. Finished Measurements: The size as written using Greta and the Fibers Silk Me Lace – 21 inches (53.5 cm) deep and 87 inches (221 cm) wide after thuggish blocking. You will also need: Stitch Markers (two that are different to mark the centre stitch), Needle (for weaving in ends), Blocking Pins and Mats, just under 1000 Miyuki, Matsuno or Toho Size 6 Seed Beads or Miyuki Size 5 triangles and a 1mm cro-tat hook to apply your beads (or dental floss, 0.6mm crochet hook, fleegle beader). You will find it useful to print your pattern on a colour printer or colour your bead placement in coloured pencils. This pattern is charted and has full written instructions. All patterning is on the right side rows only with all wrong side rows being purled. PLEASE NOTE - If using a Yarn with less than 750m/100g it will be useful to have an additional skein as yardage requirements were close for a couple of Test Knitters.